We are using our novel compounds discovered from antiinflammatory and amyloid research programs to penetrate the blood-brain barrier and regulate important physiological processes that become aberrant in neurodegenerative diseases. Figure: (Left): Amyloid peptide. i-iii : Typical electron micrographs of amyloid fibrils showing their linear, unbranched and flexible nature (i) and repeating twists of fibrils at regular intervals (ii & iii). 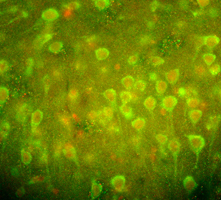 (Far Right): A GPCR known as PAR2 (green) and one of its activating proteases, trypsin (red), coexpressed in neurons of the cerebral cortex of the rat (immuohistochemical photomicrograph). Toward peptide-based inhibitors as therapies for Parkinson's disease. Mason JM, Fairlie DP. Future Med Chem 2015, 7, 2103-2105. C5a receptor (CD88) inhibition improves hypothermia-induced neuroprotection in an in vitro ischemic model. Thundyil J, Pavlovski D, Hsieh YH, Gelderblom M, Magnus T, Fairlie DP, Arumugam TV. Neuromolecular Med 2012, 14, 30-39. Amyloid formation from an α-helix peptide bundle is seeded by 310-helix aggregates. Singh Y, Sharpe PC, Hoang HN, Lucke AJ, McDowall AW, Bottomley SP, Fairlie DP. Chemistry Eur J. 2011, 17, 151-160. Inhibitors of beta-amyloid formation based on the beta-secretase cleavage site. Abbenante G, Kovacs DM, Leung DL, Craik DJ, Tanzi RE, Fairlie DP. Biochem Biophys Res Commun. 2000, 268, 133-135. Is Oxidative Damage By Beta Amyloid and Prion Peptides Mediated by Hydrogen Atom Transfer from Glycine Alpha-Carbon to Methionine Sulfur within Beta-Sheets? A. Rauk, D. A. Armstrong, and D. P. Fairlie. J. Am. Chem. Soc. 2000, 122, 9761-9767. Solution structures in aqueous SDS micelles of two amyloid beta peptides of A beta(1-28) mutated at the alpha-secretase cleavage site (K16E, K16F). Poulsen SA, Watson AA, Fairlie DP, Craik DJ. J Struct Biol. 2000, 130, 142-152. The possible origin of free radicals from amyloid beta peptides in Alzheimer's disease. Bush AI, Huang X, Fairlie DP. Neurobiol Aging 1999, 20, 335-337.